Congratulations to the Wights of the Monkeypuzzle Herd of Melrose on selling Fioleds’ first son, Monkeypuzzle Ideal at Carlisle. Fioled carried this Ironstone Brandy son when she was purchased by Walter Wight at our Production Sale in December 2012 for 10,000gns. 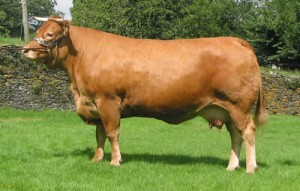 He was placed 1st in the pre-sale Show and travelled back to Wales with his new owners, Attewell Farms, Newport. Posted on 19th February 2015 at 3:27 pm. Dyfri Idris becomes the fourth home bred Dyfri bull to win the Junior Male Championship at the Royal Welsh Show. 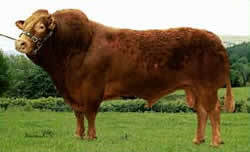 Having won the January young bull class he was tapped out by judge Peter Kirton as the Junior Male Champion. Sired by the 50,000gns Wilodge Cerberus, he is out of the young Nectar daughter, Dyfri Elle. She herself is out of Dyfri Undeg, a Jockey x Harpie full sister to Neutron (14,000gns). Posted on 18th February 2015 at 4:26 pm. Toujour is one of those cows that you dream of owning! 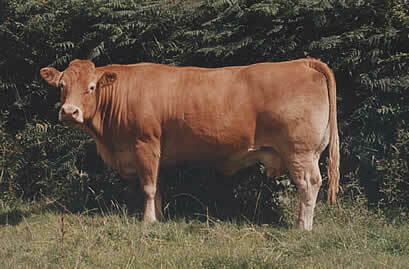 She had a successful show career, winning the Royal Welsh Show on 3 occasions, and her lifetimes’ production of bulls averaged over £6,000 in the early 90’s. Not only that, but her daughters and granddaughters are proving equally productive. Posted on 18th February 2015 at 10:34 am. Vagabonde was our other purchase from the Tanhill Dispersal Sale. She was a daughter of the great French sire Jeunot, from one of the most important French female lines at M Bourbon’s famous herd. 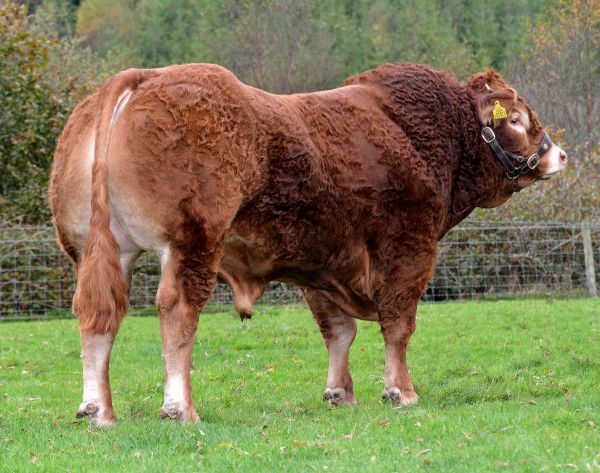 She bred for us a Denver son, Grand Prix, who won the Interbreed Young Bull Championship at the Royal Welsh Show, and was subsequently sold to the Scottish MMB for their A.I. stud. Posted on 18th February 2015 at 10:30 am. Michelle was purchased as our choice of the Favori daughters at the first Oakley Sale. She joined our herd when she was 10 years old, but more than justified our investment, being a prolific embryo donor and breeder of several high priced progeny. Her daughters are very feminine stylish animals, and again, her last daughters – three Ronick Gains Cows – have proved to be among her best. Each one bred a cracking Jockey bull apiece selling from 6,000gns to 10,000gns in the late 90’s. The present herd contains Ultrabright – an outstanding breeder – and her daughters. Posted on 18th February 2015 at 10:19 am. 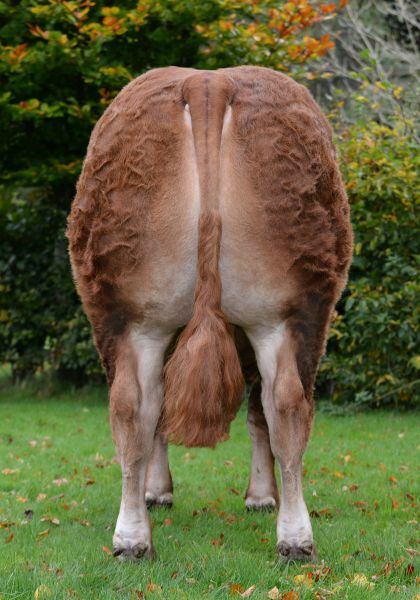 Olive was bought as part of the Derri Herd and has returned her investment several times over. A prolific embryo donor she really became the herds’ moneymaker. 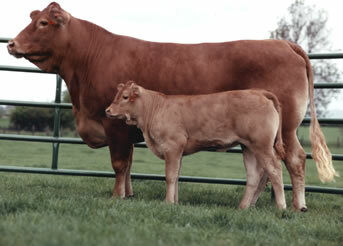 From her first flush she produced six heifers that were retained in the herd and three bulls, one of which – Consul – was exported to South Africa and subsequently became Supreme Champion at the Pretoria Royal Show. 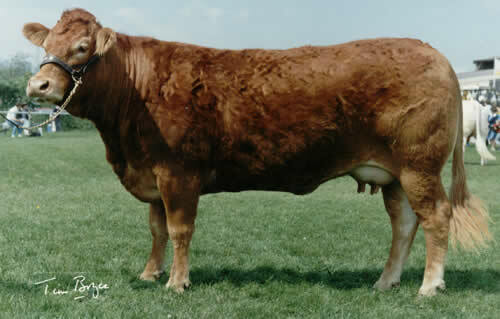 Another bull from the same flush was Cardi, which was sold to Genus for its AI stud and became, arguably, the UK’s most successful AI sire. 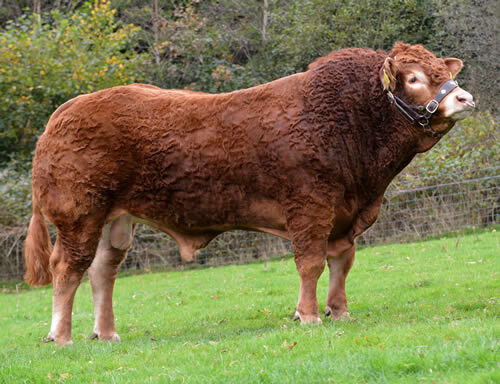 A grand daughter became a great breeder – Natalie is the dam of Tanner, the Junior Champion at the 2003 Royal Welsh Show, and sold for 16,000gns; his full brother, Union won the same class at the Royal Welsh, and sold for 10,000gns; a third son, Vantage also won Junior Champion Royal Welsh. Brenhines, a full sister to Tanner and Union carries her influence on to the present day. Posted on 18th February 2015 at 10:18 am. Bred by the Druk Farming Co.
Nadia came as part of the Derri Herd, having been purchased at the Druk Dispersal Sale as the top priced Maiden Heifer. Principally, her Talent daughter, Evita and her progeny have carried her influence into our herd. Evita is one of our top bull breeders with sales up to 10,500gns and several over 5,000gns. Several descendants are breeding well in the herd today, led by the Jockey daughter Dyfri Superbe, one of our top flushing cows. Harpie was imported in the same consignment as Jockey in 1997 and was joined by her Jockey son, Neutron, at heel. She carries the important Lingot line in her back pedigree, which makes her an exciting prospect to mate to Jockey. Both her grand dams have the highest qualification in France – Reproductrice Recommande, and she confirms that depth of breeding by her depth of milking and consistency of production. Harpie bred 4 Jockey sons on the trot that grossed £40,000 pounds at sale. They include Neutron 14,000gns and Pascal 9,500gns. Her family develops through her daughters Undeg and Alaw, with Elle (Nectar x Undeg) breeding the most recent Junior Champion at the Royal Welsh in 2014, Dyfri Idris. Posted on 18th February 2015 at 10:17 am. Nenette was purchased in Autumn 2002 to establish another line. 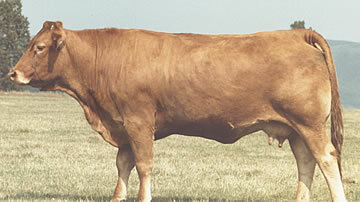 She comes from an important family of Show and Breeding cows in France. 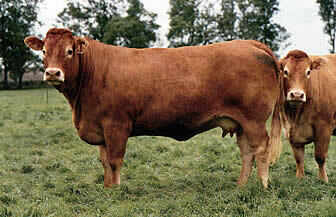 She was 2nd Paris Show 2002 and was Reserve Female Champion Royal Welsh Show 2003. Her Nectar daughter, Charmante, is a massive cow and three of her heifers are joining the herd. Posted on 18th February 2015 at 10:14 am. 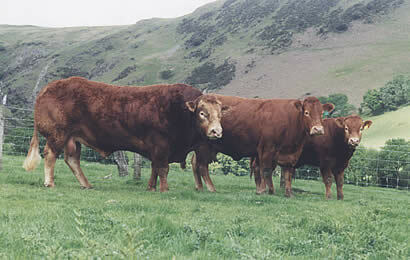 We imported Joule in late 1998, again as a proven bull whose progeny impressed us greatly. As a young bull he was sold through the famous Lanaud Sales in France for a record FF169, 000 (approx £18,000) to Brazil, a record that he still holds. Unfortunately (fortunately for us!) a change in export restrictions meant that he stayed in France until he was resold to us. Unfortunately, we lost Joule just as he was to really to get to work on the Jockey daughters – the job he was bought for. However, through AI he made an impact on the herd, leaving many fine females. Posted on 18th February 2015 at 10:05 am.